Kate Orff is the director of the Urban Studies Program at GSAPP, Columbia Graduate School of Architecture, Planning and Preservation, as well as the founder of SCAPE, a landscape architecture firm. The lecture served to give an overview of the projects that SCAPE has been involved with. 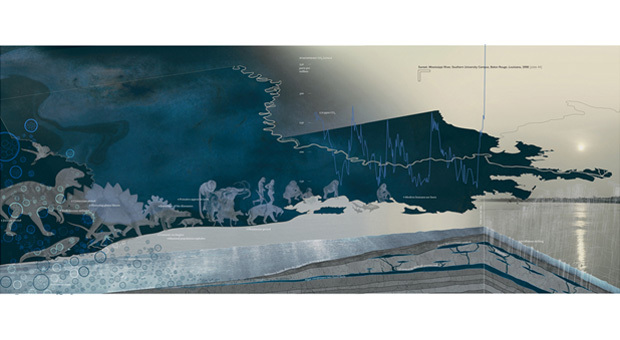 The first project that caught my attention was Petrochemical America which looks into the “economic ecologies along 150 miles of the Mississippi River from Baton Rouge to New Orleans, an area of intense chemical production” (SCAPE). This project is not only fascinating in what was done in itself but also about how the information found was displayed. SCAPE made a point to portray data in their drawings that immediately captivates the viewers. What could have been simple graphs and pie charts turns into elaborate layers of data compacted into one complex drawings, that isn’t too hard to understand. For more information on the project, visit this link. GSAPP usually does guest lectures like these all the time which are pretty much open to everyone. It’s a resource that many don’t know we have but architecture and urban studies students should definitely take the chance to go to one of these lectures if you haven’t already. The GSAPP websites posts tons of events that are just as insightful as this one. Manuela Hiches is a Junior at Barnard and Managing Editor for The Nine Ways of Knowing.